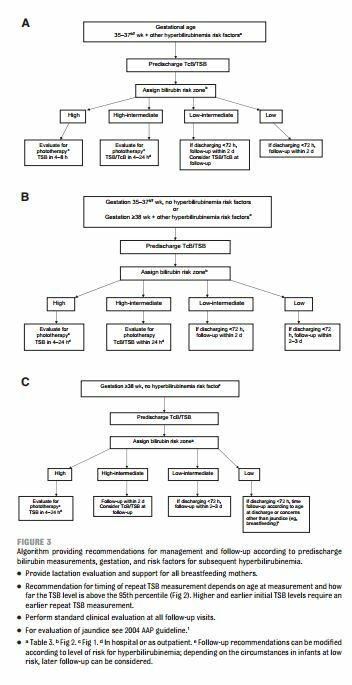 ← Should We Screen Asymptomatic Young Athletes for Hypertrophic Cardiomyopathy in an Attempt to Prevent Sudden Cardiac Death? Jaundice (a yellow tint of the skin and whites of the eyes) in newborns is due to buildup of the chemical bilirubin in the blood and tissues. A low level of bilirubin in newborns is common in many newborns. However, if the blood level of the bilirubin becomes too high it can cause serious brain damage called kernicterus. It is to attempt to prevent this dangerous buildup that we doctors will monitor the bilirubin level with either a blood test or a skin test (the transcutaneous bilirubin monitor). The American Academy of Pediatrics Guidelines Update for Neonatal Hyperbilirubinemia (1) in 2009 and the earlier 2004 Guidelines for Neonatal Hyperbilirubinemia (2) provide guidance on when and how to treat high bilirubin levels in newborns. Measure the bilirubin level in any baby who appears jaundiced in the first twenty four hours. 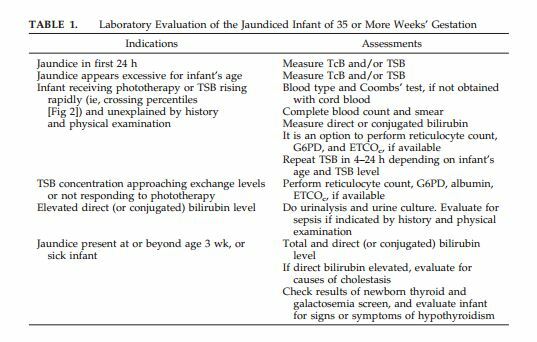 Don’t do visual estimate of jaundice—it leads to errors. 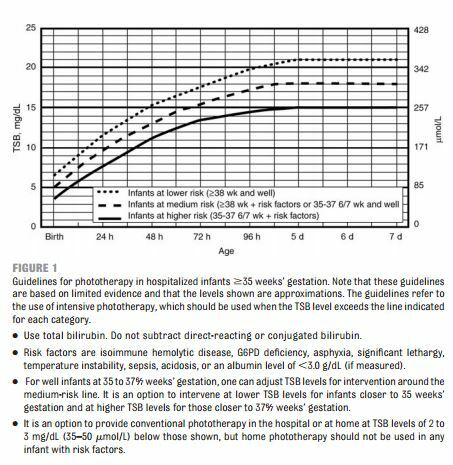 Interpret the bilirubin level according to the infant’s age in hours. Infants less than 38 weeks gestation at birth and especially if they are breast fed are at high risk of dangerous levels of bilirubin. Perform a risk assessment (assess for risk factors that place the newborn at increased risk of dangerous levels after discharge). Make sure you provide a specific time for mother and to come back for retest of the bilirubin (based on the baby’s level at discharge and on the baby’s risk factors. 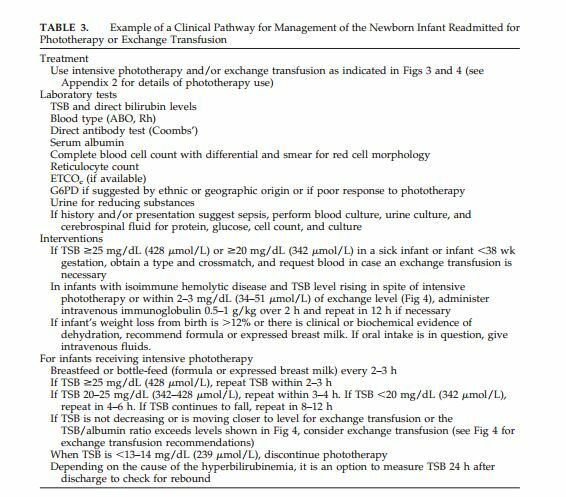 Treat the newborn, when indicated by guideline and risk factors, with phototherapy or exchange transfusion. Every baby needs a bilirubin level drawn prior to discharge and also needs a formal risk factor assessment. 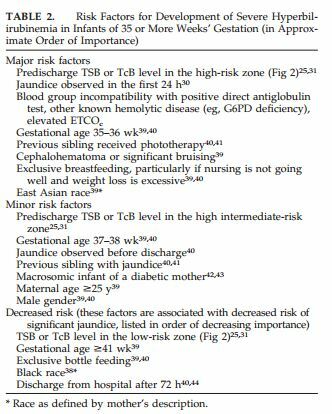 Important risk factors for hyperbilirubinemia–Predischarge TSB or TcB measurement in the high-risk or high-intermediate–risk zone; Lower gestational age; Exclusive breastfeeding, particularly if nursing is not going well and weight loss is excessive; Jaundice observed in the ﬁrst 24 h; Isoimmune or other hemolytic disease (eg, G6PD deﬁciency) Previous sibling with jaundice; Cephalohematoma or signiﬁcant bruising; East Asian race. And risk factors that increase the risk of hyperbilirubinemia neurotoxicity [at a given bilirubin level]–Isoimmune hemolytic disease; G6PD deﬁciency; Asphyxia; Sepsis; Acidosis; Albumin < 3.0 mg/d. The authors point out that even with a low predischarge bilirubin level, the risk of serious hyperbilirubinemia is not zero. That is why all newborns discharged at less than 72 hours need to be seen within 2 days of discharge. 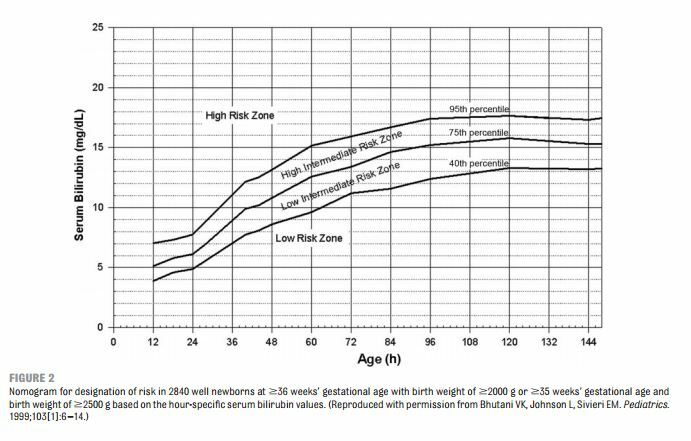 (1) Hyperbilirubinemia in the Newborn Infant 35 Weeks’ Gestation: An Update With Clarifications. American Academy of Pediatrics. Pediatrics 2009;124;1193. 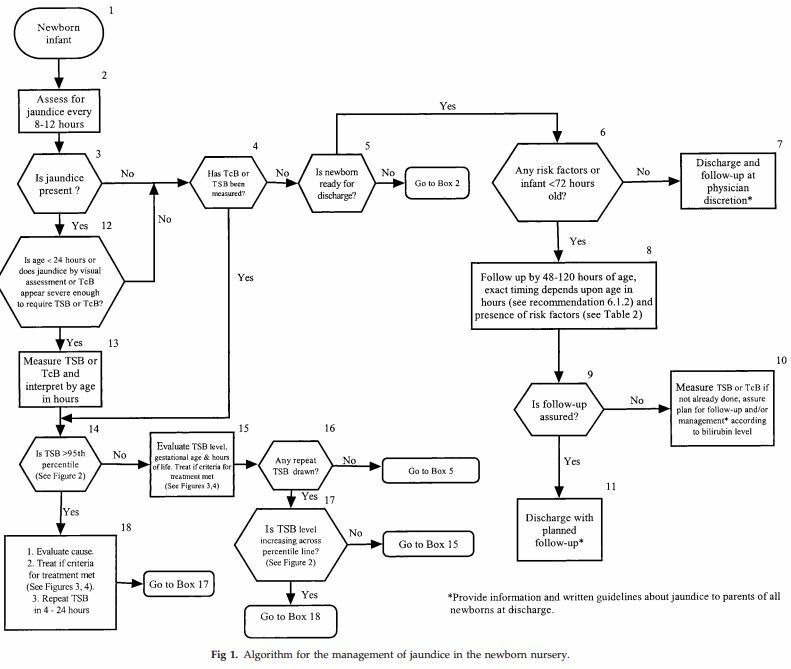 (2) Management of Hyperbilirubinemia in the Newborn Infant 35 or More Weeks of Gestation. American Academy of Pediatrics. Pediatrics 2004;114;297 . (4) BiliTool—A quality improvement tool for newborn bilirubin management available at http://bilitool.org/. This entry was posted in Guidelines, Laboratory Tests, Neonatology, Pediatrics. Bookmark the permalink.